In partnership with CUPW, the Canadian Union of Postal Workers. The Canadian Union of Postal Workers (CUPW) represents 50,000 members from coast to coast to coast who work for Canada Post. On November 27, over 50,000 postal workers in Canada were legislated back to work by the Liberal government after five weeks of rotating strikes, effectively removing their right to free and fair collective bargaining and their right to strike as per the Canadian Charter of Rights and Freedoms. 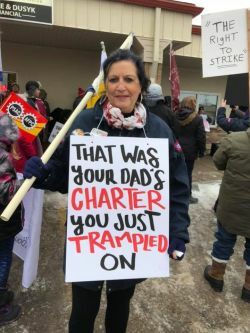 By taking away the workers’ right to strike and to negotiate agreements, the government has effectively decided that corporations and businesses are more important than workers’ Charter rights. For over a year, the Canadian Union of Postal Workers (CUPW) has been negotiating with Canada Post to reach collective agreements that address major issues that have plagued workers for years – skyrocketing injury rates, inequality, overburdening and overwork, and a reliance on precarious employment. The government has not only removed the right to strike, it has forced postal workers to return to their jobs and endure the same old unresolved issues at the busiest time of the year. Since postal workers were legislated back to work, the labour movement and community members have come together, setting up pickets and demonstrating at numerous Canada Post facilities across the country in solidarity with postal workers. Some allies have even been arrested, held in jail overnight and must return to court in the new year. A fund has been set up to cover legal costs. If you’d like to donate, please visit this GoFundMe page. The right to full and fair collective bargaining and the fundamental Charter-protected right to strike are always worth defending. Bosses and governments have never given us rights that we haven’t fought for, and those rights are meaningless if not defended. Help CUPW do that: send a protest message to the government of Canada.